An exchange is a reciprocal travel program in which you and your students will travel abroad and be hosted by a partner school and later host this same school in your own hometown. During the exchange you will be fully immersed in the daily life of your foreign host by attending their local school, participating in sports and extra curricular activities, sharing dinners with your host family and experiencing their daily routine. An exchange is one of the most rewarding travel opportunities for students, teachers and communities alike! Setting up an exchange program with Prométour couldn’t be easier! Step 5: Last but not least, we will help you to organize your parent meetings, set-up your student registration platform online and violà- you will be ready to engage in a cultural exchange that will leave a lasting impact on you and your students! When do you need to submit the project to your administration? The following Terms and Conditions were updated April 27, 2016 Teachers wishing to use the services of Prometour for an exchange program agree to the following terms and conditions:1/Preamble The teacher, school and students wish to participate in a school exchange program with a European school through Prometour.2/Role of Prometour will find you a compatible and complementary school in France/Spain that is willing to establish an exchange program with your school. Prometour will assist you and your school with informing the parents and school administration about the educational benefits. Prometour will also help you complete all necessary documentation for the preparation and realization of the trip. Prometour will be responsible for the journey to and from your school to the destination school in France/Spain. Prometour will obtain medical insurance for all participants in the exchange and provide the school’s representative with a copy of the policy prior to the date of departure. Prometour will be responsible for the necessary coordination between the two schools. On your request, and prior to the date of departure, Prometour will organize excursions to meet your educational goals. 3/ Role of your School when travelling to France/Spain Your school is required to form a group of students interested in participating in an exchange program with a school in France/Spain. As your school’s representative, you will collaborate with Prometour during the preparation and while on the trip. By participating in Prometour´s exchange program, you and your school agree to receive French/Spanish students during the dates agreed between both schools.4/ Role of your School when hosting the French/Spanish students Your School agrees to receive a group of students from the companion French/Spanish school and provide those students with a safe and comfortable environment. Your school will ensure that the families whose children participate in the trip will in turn host the French/Spanish students. The families of your school´s participants will provide transportation for the French/Spanish students between their homes and your school.5/Prometour is responsible for the preparation and activities during its organized trips. In the event that a trip cannot take place due to events or circumstances caused by the French/Spanish school, or to an unforeseeable and insurmountable act by a third party or Act of God, Prometour will not be held responsible for the changes in the travel schedules, however, Prometour will find another French/Spanish school for the exchange within a reasonable period of time.6/ Exclusivity It is understood that your school agrees that it is benefiting from the experience and know-how of Prometour with regards to the organization and coordination of the exchange program. 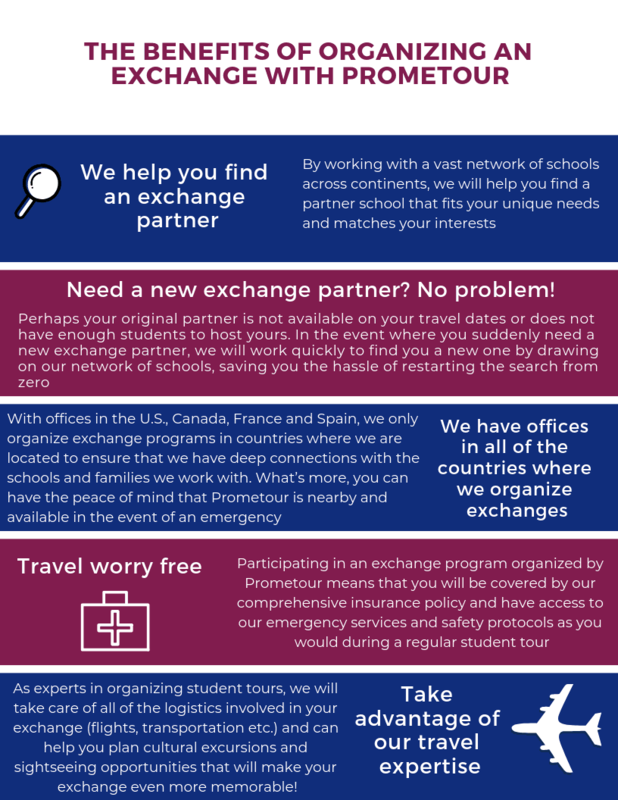 Your school agrees that any future exchange programs with the same school will be arranged exclusively through Prometour and that no exchanges will be arranged independently between the two schools.